Facebook has introduced a new feature in its platform that has been designed to make it easier for bug bounty hunters to find security flaws in Facebook, Messenger, and Instagram Android applications. Since almost all Facebook-owned apps by default use security mechanisms such as Certificate Pinning to ensure integrity and confidentiality of the traffic, it makes it harder for white hat hackers and security researchers to intercept and analyze network traffic to find server-side security vulnerabilities. For those unaware, Certificate Pinning is a security mechanism designed to prevent users of an application from being a victim of network-based attacks by automatically rejecting the whole connection from sites that offer bogus SSL certificates. “Choose not to use TLS 1.3 to allow you to work with proxies such as Burp or Charles which currently only support up to TLS 1.2,” Facebook says. Whitehat Settings is not visible to everyone by default. Instead, researchers have to explicitly enable this feature for their Android apps from a web interface on the Facebook website, as shown. “To ensure the settings show up in each mobile apps, we recommend you sign out from each mobile app, close the app, then open the app and sign in again. The sign in process will fetch the new configuration and setting updates you have just made. You only need to do this once, or whenever you make changes to these settings,” Facebook says. Once enabled, you’ll see a banner at the top of your app (Facebook, Messenger, or Instagram) indicating that the network testing is enabled and your traffic may be monitored. 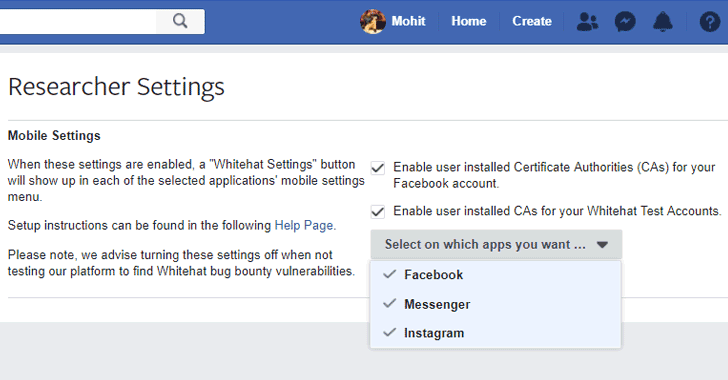 If you want to test the Instagram app for security vulnerabilities using the newly-launched Whitehat Settings, you are first advised to link your Instagram app with your Facebook app. 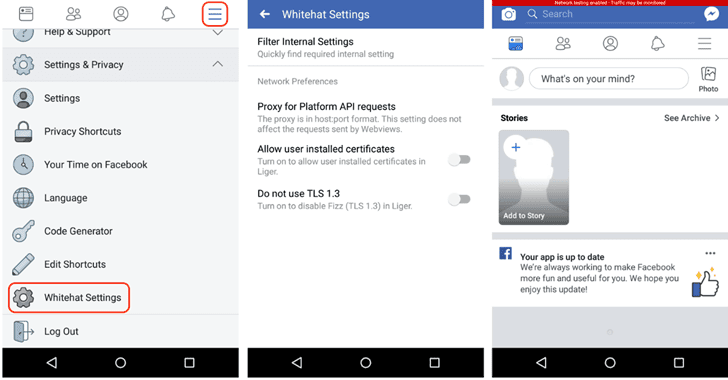 It should be noted that Whitehat Settings are not meant for everyone to use, as it reduces the security for Facebook apps installed on your device. “For the security of your account, we advise turning these settings off when not testing our platform to find Whitehat bug bounty vulnerabilities,” the social media says. How do you feel about this new setting? Let us know in the comment box below.